Culebra National Wildlife Refuge is one of over 400 wildlife refuges administered by the U.S. Fish and Wildlife Service in the United States, Puerto Rico and U.S. territories. These refuges, managed principally for migratory birds and other unique wildlife values, are part of the National Wildlife Refuge System in the Department of the Interior. The Culebra Refuge, which comprises about 1,480 acres, includes 23 islands and rocks in addition to the four tracts on the main island of Culebra. The refuge is well known as a nesting site for a variety of seabirds and preserves important habitat for endangered sea turtles and the Culebra giant anole. 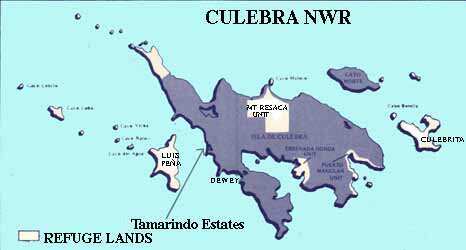 The mean temperature for Culebra is about 80 degrees Fahrenheit (27 degrees Celsius). 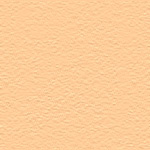 A relatively dry period occurs from January to March-April. The heaviest rains generally are recorded from August to November. The average rainfall is approximately 25 - 30 inches (635 -763mm). Culebra and Culebrita were reportedly first discovered by Columbus on his second voyage in 1493. The first known inhabitants on the island were Taino Indians. Throughout the years of the rich Spanish trade with the new world, Culebra's protected harbor served as a base for pirates. When the first colonists arrived, in 1880, from neighboring Vieques and Puerto Rico, the indians and pirates were gone and the chief obstacles to colonization were swarms of biting flies and mosquitos. In 1898 Puerto Rico was ceded to the U.S. by Spain at the end of the Spanish-American war and in 1901 the Culebra Naval Reservation was established. With the outbreak of WWII, the Culebra Archipelago became the primary gunnery and bombing practice site for the U.S. Navy and continued to be used for these purposes until 1975. The Culebra National Wildlife Refuge was established on February 27, 1909 by Theodore Roosevelt, making it one of the oldest refuges in the system. Early ornithologists, including B.S. Bowdish, A. Wetmore and S.T. Danforth, described the birds in and around the Culebra Archipelago, but it wasn't until 1971 that new surveys by the Keplers revealed the wide variety of nesting seabirds and their numbers. The offshore islands (except Cayo Norte) totaling 702 acres came under Fish and Wildlifc Service Administration in 1975 when the Navy left Culebra. In 1982 an additional 776 acres, of unique wildlife habitat, were transferred from the Navy into the Culebra National Wildlife Refuge. The cays surrounding Culebra support impressive numbers of breeding seabirds. From May to September nesting colonies of laughing gulls, bridled terns, sooty terns, brown noddys and roseate terns can be found. Several cays also support royal and sandwich tern colonies which have been reported to be on the decline in the Caribbean in recent years. Small colonies of white-tailed tropicbirds, red-billed tropic birds, masked boobys, and red-footed boobys are found here, as well as a thriving brown booby colony. 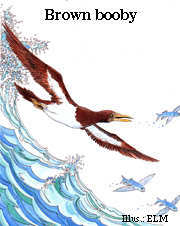 Seabird breeding activity can be found going on throughout the year. Culebrita and Cayo Luis Pena are the larger and more diverse islands. This diversity includes beach areas, extensive forests, lagoons and rocky precipices. As a result, a wider range of wildlife, including many passerine bird species, waterfowl and reptiles is present. The beaches of Culebrita are included as critical habitat he endangered hawksbill turtle, as are most beaches of the northern shore of Culebra. 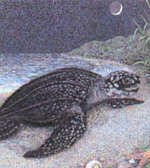 Three other endangered turtles species, the Atlantic green, the leatherback, and the Atlantic loggerhead also occur here. Extensive reef systems and grass flats in Culebra's waters are critical as development and foraging habitat for these turtles. Coral reefs of the area are some of the most spectacular of the entire Caribbean region. These thriving reefs represent some of the best living healthy reef ecosystems of Puerto Rico due to the relative lack of development of the islands. The life cycles of many fish, amphibians, crustaceans and a wealth of other marine organisms are directly tied to the coral reef ecosystems. The Flamenco Peninsula is an important site for sooty terns. The population had been estimated at as many as 160,000 birds in recent history, although this population had declined significantly during the late 1970's. Brush encroachment on the preferred breeding area of dense guinea grass, past overgrazing, and predation by introduced rats and feral cats were some causes for the decline. The Mount Resaca Unit of the refuge insures preservation of one of the few remaining large blocks of dry subtropical forest on Culebra. Large boulder covered areas produce the park-like forest of Cupey and Jaguey with their impressive stilt roots. The boulders support beautiful orchids, bromeliads and the endemic peperomia. It is believed that the Culebra giant anole still survives in these forests. Other vegetative zones, including the thick natural thorn thickets, palm forest types and cactus scrub associations, support diverse numbers of bird and reptile species. The mangrove units of the refuge form a unique habitat which is vital for coastal wildlife. Here the protein rich waters provide ample food sources for crustaceans and small fish, and, in turn, these food sources attract larger predatory fish as the food chain continues. These mangroves form bountiful nurseries for marine life. Multitudes of fish and crustaceans arrive after spawning to mature in its protected waters. Bird life also abounds as the large fisheries attract numerous marine feeders. The mangroves surrounding Puerto del Manglar are a favorite roosting site for the endangered brown pelican. These same mangroves also protect this bay's phosphorescent qualities by serving as a filter and buffer from sediments carried by runoff from the surrounding sloping terrain. Active wildlife management efforts on the Culebra National Wildlife Refuge concentrate on maintaining and recreating the wide range of nesting habitats needed for colonial seabirds. Unique wildlife habitats such as the Mt. Resaca Unit and the mangrove areas will be maintained in their natural conditions. Human entry into the nesting colonies will be restricted in order to prevent disturbance to sensitive species who cannot tolerate human intrusion. Development of the existing Mt. Resaca trail, and trails on Cayo Luis Pena and Isla Culebrita may be planned for the refuge in the future. The Mt. Resaca trail, Cayo Luis Pena and lsla Culebrita are all open daily from sunrise to sunset. Special Use Permits, signed by the refuge manager, are required for entry to other units of the Culebra Refuge. These permits and other information are available from the refuge manager at Lower Camp, Culebra. Flamenco Peninsula and several of the cays and reefs were sites of intensive bombardment by the military. Many unexploded bombs are present throughout these areas and could explode at any time. Do not touch, approach or disturb any ordnance seen. Visitors must stay on existing roads and trails. Visitors entering the water from the refuge beaches do so at their own risk. There are many rocks, coral reefs and marine organisms which could cause injuries and visitors need to be careful in the water. The following public use regulations apply to the lands administered by Culebra National Wildlife Refuge in order to insure protection of the rich and diverse resources. o The molestation, hunting and/or possession of birds, lizards, snakes, turtles and land crabs is prohibited. o Coral collecting, both living and dead is prohibited. o All plant material, both living and dead, is protected. o Littering, fires, firearms and motorized vehicles are prohibited. o No domestic or wild animals may be brought onto refuge lands. 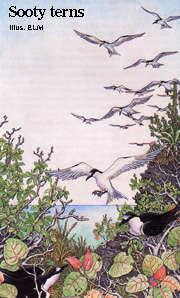 * The above information on the National Wildlife Refuge of Culebra and the illustrations, drawn by E.L.M., were taken from the following publications of the Fish and Wildlife Service: Culebra National Wildlife Refuge, RF-41522-1- May 1988, and Caribbean Islands National Wildlife Refuge, August 1997. 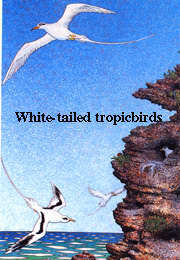 The illustrations represent, in the order of appearance, the leatherback turtle, brown booby, sooty terns, and the white-tailed tropicbirds found in the Culebra NWR. 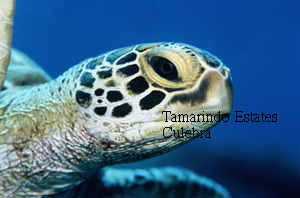 The photo is that of a green turtle.